Thanks OnPoint! 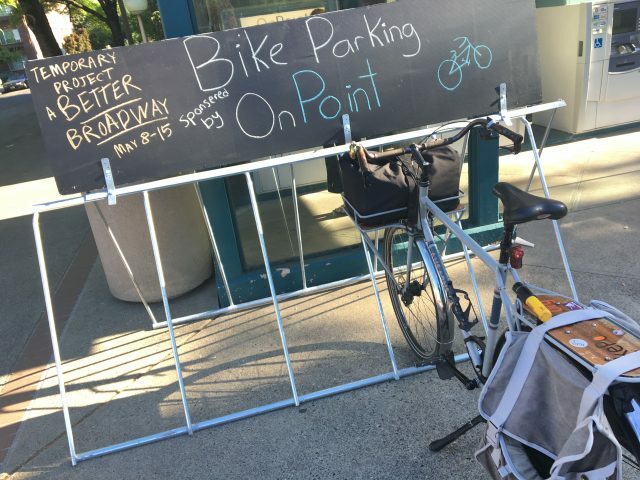 One of the new bike parking corrals that went up last night. 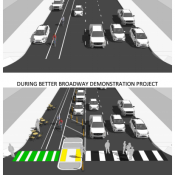 As promised, the Better Broadway project got a few improvements since our post yesterday. I went out there again this morning to take a second look at how things were shaping up. Before I share more photos and thoughts about the project, I want to say thanks to everyone who has shared their opinion about it in the comment thread of yesterday’s post. One of the main goals of Better Block is to “start a conversation” and hear feedback from the community. We’re happy to act as a conduit for that aspect of the project. In order for Better Broadway to reach its potential, more businesses need to “activate the space” in front of their stores. The idea was for all the auto parking to leave the curb and “float” in the street — thus freeing up space in front of businesses for eating, hanging out, parking bikes, or whatever. 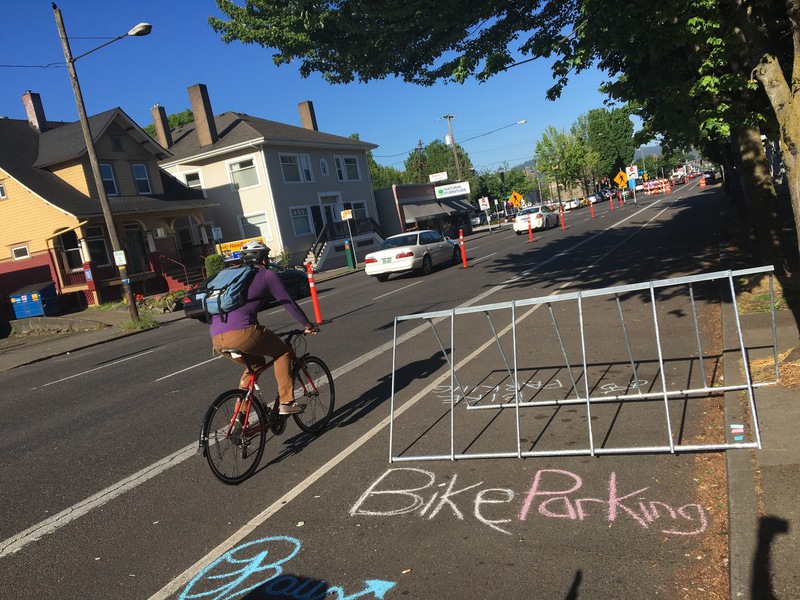 In hopes of spurring that, Better Block put out a bunch of temporary bike racks. I came across one at Chen’s Dynasty restaurant, OnPoint Credit Union, and a few others. I also noticed that the bike racks were strategically placed to prevent people from darting into the new protected lane prior to making a right turn. So far, the “street fair” atmosphere hasn’t materialized. Hopefully by the end of the week more businesses will embrace the space. The floating parking lane. If only this could be done for the entire length of the project! Another hope for project organizers was to have the auto parking lane act as a buffer between different uses of the street. Unfortunately they haven’t been able to pull that off for the entire length of the project. But there is one block where they’ve managed to make it happen. Between 15th and 16th they’ve added a bunch of temporary striping (a.k.a. white tape) to designate the parking lane. I saw several people pull in and park in the floating parking lane. It looks great, it frees up the curb lane and it appears to be working very well. Another thing that’s working very well — and what might be the star of the whole show — is the temporary floating transit island. At NE 16th, local company JRA Green Building donated their time and materials (with wood donated by Sustainable Northwest Wood) to construct a new TriMet bus stop complete with a curb ramp from the sidewalk, a new crosswalk and a fully ADA-compliant waiting area. This morning I watched several people use this new island without any issues at all. It was marvelous to see! The sign cautions bicycle riders to stop for people on foot. Waiting for the bus on the new island. At the western end of the project I met a man who was using a mobility device. 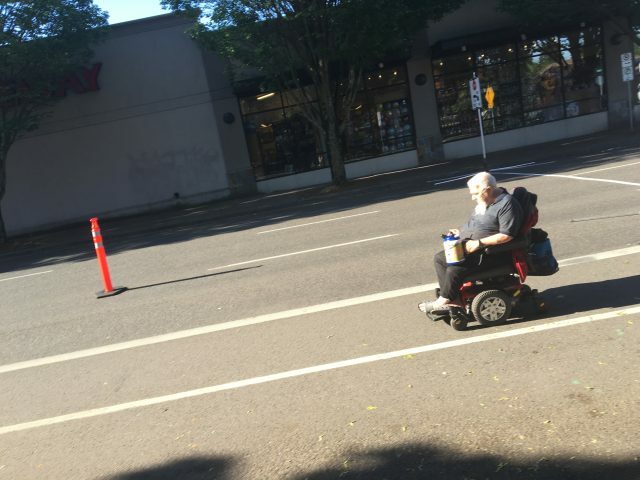 I was riding on the sidewalk going in the opposite direction of the street and I watched him pull right out into the new protected lane. I chatted with him for a few minutes and he told me he was very appreciative of the extra space. “The sidewalk’s too bumpy!” he said. He also said it’s hard for him to navigate around tables and chairs that restaurants put on the sidewalk. As I watched him calmly motor his rolling chair up the new lane it made me think we could easily make this a two-way configuration. Ideally the entire Broadway-Weidler couplet would be abolished in favor of two-way streets; but if that doesn’t happen maybe we could try a two-way biking and walking lane on the north side. There’s clearly demand for two-way access and no one likes it when people bike on the sidewalk in a commercial area. If we constructed little ramps to roll over the curb extensions and got rid of the curbside auto parking it might work. Of course bicycle riders would have to perhaps slow down a bit and be courteous of other road users for it to work. What do you think? The only way to truly understand this project is to spend some time on Broadway. And on that note we’ll be leading a ride tomorrow (Wednesday) to encourage folks to experience Better Broadway. We’ll meet at the Moda Center plaza near the fountain at 6:00 pm to soak up the Trail Blazers playoffs vibe. Then around 6:30 we’ll head up to Broadway as a group to check out the project. Then we’ll find a great place to watch the game on TV (it’s in Oakland) and support local businesses. Join us! A protected bike lane that allows people to drive in it in order to park their cars in the bike lane and sidewalk activation area is a failure. The whole point of this project was to show how the street could be transformed for the better. If we can’t even design a temporary project without compromise, then we are in serious trouble. This is another example of a terrific idea from BetterBlock that was severely watered down by our timid city leadership. Adam, I’ve heard different reports about this but my understanding is that the design approved by the city was to have a floating parking lane throughout the 0.8-mile project, and the volunteers who set it up late Sunday night ended up calling an audible and keeping the curbside parking because there were still cars parked curbside and it would have taken many, many more person-hours and supplies to do 17 blocks of striping. So why is the project 17 blocks long? I’ve heard different accounts of that, too, but Better Block’s Ryan Hashagen probably knows if anyone does, and he told me today that it was because businesses along the full stretch wanted to be part of it. Do you have some information about this being a problem of timid city leadership? Then perhaps Better Block bit off more than they could chew this year. This just emphasizes the need for Janette Sadik-Khan style “cheap semi-permanent improvements” rather than dropping some construction bollards and tape down. That’s not to say I don’t value Better Block. What they are doing is great. But perhaps we need more investment from the city on larger projects like these. 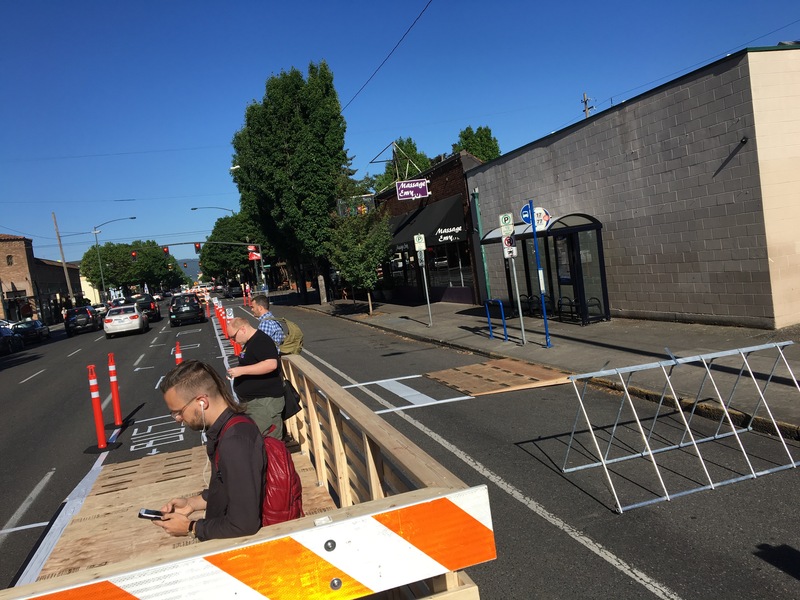 My understanding is that the focus area is meant to only be a few blocks long, but Better Blocks also wanted to collect data about the effect of removing a lane for the whole stretch from 7th to 24th, to demonstrate that it could be done permanently. So the “road diet” portion is really long, but the actual activated area is just a few blocks. It makes it confusing, though. It would be great to have ongoing, dedicated City funding for partnerships with Better Block, but the reality is that doesn’t exist right now. So Better Block has to make do with volunteer labor and homemade materials and cones. Los Angeles and New York both have City funding for these kinds of demonstration projects, and it would be great if people could push for something like that to happen here. Adam, These are volunteers who have worked into the wee hours making Better Broadway happen. If you want to see parking protected on the whole corridor, get out and volunteer. From what i heard, BB ran out of volunteer labor and was logistically challenged at removing the cars that were already parked. On another note, do you ever make a positive comment here? “Go volunteer of you don’t like it” is not realistic. Not everyone has the time or energy to volunteer. IMO, this just demonstrates that volunteer projects are not enough. We need support from the city to make large projects like this work. 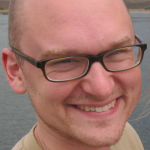 You seem to have enough time to make negative comments on each and every blog post, Adam. IMO, that is time that could be spent better by volunteering. It is easy to criticize but hard to be constructive. Please try harder. I’d like to respectfully interject here. Adam, I typically try to appreciate at least some aspect of each and every one of the comments I read of yours, but this one really got to me. Your argument that “Not everyone has the time or energy to volunteer.” reminds me of the argument you often call out that “Not everyone can go car-free.” You are very quick to judge and jump on people who say that, and it really irks me to see you make the same type of argument towards something like this. I am one of the Better Block PDX volunteers who has been working tirelessly to get these projects on the ground since January 2015. No exaggeration, I’ve probably spent somewhere between 10 and 20 hours a week on BBPDX projects, while finishing my degree, interning while going to school, and then finding a job and working 40 hours a week as a transportation analyst, also working to make the streets just a little bit better. And I know that every single one of the other volunteers has a similar story. I understand and appreciate that “not everyone has time or energy to volunteer”, but I wanted to let you know that your comment hurt a lot because you are always quick to point out the flaws (while also being a fan, and I do appreciate that) but don’t come out to help in the set-up and provide your insights in person. You were at the Salmon street fountain a few Sundays ago when we were setting up Better Naito, and I assumed it was to join in the set-up, but apparently I was wrong because you left before we really got started. I make sure to read all comments on here about BBPDX projects, as well as those on OregonLive and any other media outlet. I listen to people say “whoever planned this is a complete idiot”, “these people are F*ing STUPID”, and “this is the worst thing I’ve ever heard of”, but I take in stride these comments and try to make sure I realize where they are coming from and what, if anything, we can do better next time to get it right. But this comment was the worst. Because though we have different approaches and understandings towards things, we’re all working towards the same goal – a better, safer, and more comfortable City. I understand that you all work hard and put in the time. I certainly appreciate all the effort you do and am not trying to invalidate it. I’m just frustrated that the city doesn’t seem to give you the tools to make these large-scale projects succeed. If the point is to show people how a street transformation can work, but there are serious issues that the city is not helping you address, then how will you meet this goal? Understand that I criticize things because I want them to succeed and I’m increasingly frustrated by recurring problems that are easily solvable. I love the work you’re doing. I just think the city bureaucracy is holding you back! I’m also not a fan of the attitude that because I didn’t help set up cones, I don’t get to voice concerns. I doubt that my being at the Better Naito set up would have addressed the issues of people parking in the lane. Honestly, before all the projects started going in, I wanted to volunteer, but couldn’t figure out how. Your website has a volunteer page, but it just says “stay tuned”. I couldn’t find any contact email. Your google group doesn’t seem terribly active. I was able to contact Better Block over Twitter today and plan on attending the volunteer action tonight! I am sorry I hurt your feelings, I totally appreciate all the work you and other volunteers put into these projects and did not mean to insult your efforts. I will work to highlight the positive work others like you are doing and not just always react negatively online. Thanks for sharing how you feel. Better Broadway is better than nothing! I appreciate your response a lot. Beauracracies have limitations and my biggest goal is to work with them to try to have the best possible outcome – and like anything, there is work to do. I would like to give PBOT credit though as they have been nothing but willing to work with us to get these projects on the ground. Hooray for the transit islands. It’s time we install them at other locations throughout the city. 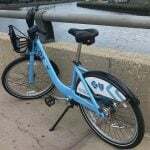 I rode in from NE 21st to NE 7th this morning and found it very user friendly. That was at 7:30 am so not a lot of car traffic. The evening before I drove the length by car and there seemed to be a lot of confusion. the lights are timed for cars and because there was a little more congestion, it made for some extra delays. I like it and hope that business owners will get on board with the street fair. It would be great if people could detour from their regular route on Tillamook to show support. Greater numbers will show what can and should be. 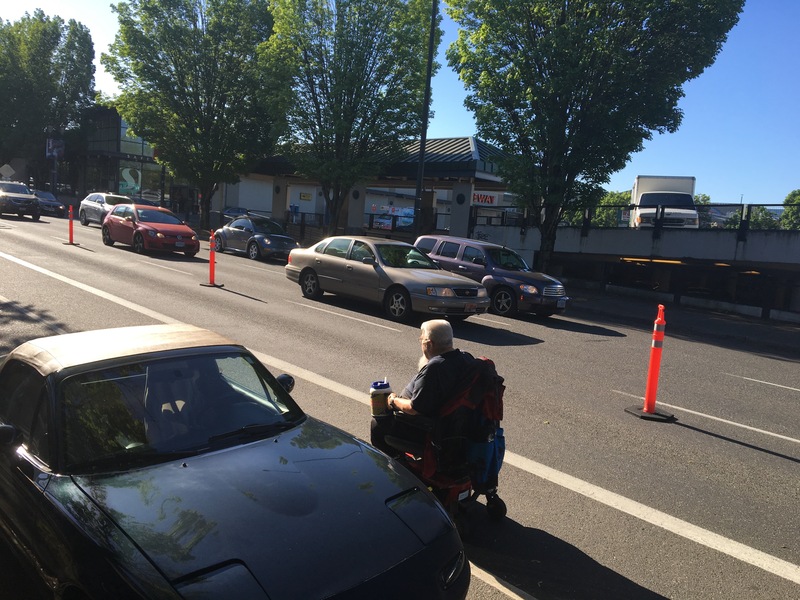 Broadway-Weidler need to become two-way streets. Why? One-way streets are much easier and safer to cross at unsignalized and unmarked intersections in my experience. Compare crossing the Hawthorne/Madison couplet west of SE 12th vs crossing Hawthorne when it’s bi-directional east of 12th. Or even compare it to crossing SE Stark (one lane of traffic in each direction) on a busy day. It’s a lot easier to pick out a long gap in traffic if the traffic is unidirectional than bidirectional. Part of the problem is the amount of lanes to cross too. We need to get rid of four lane streets. 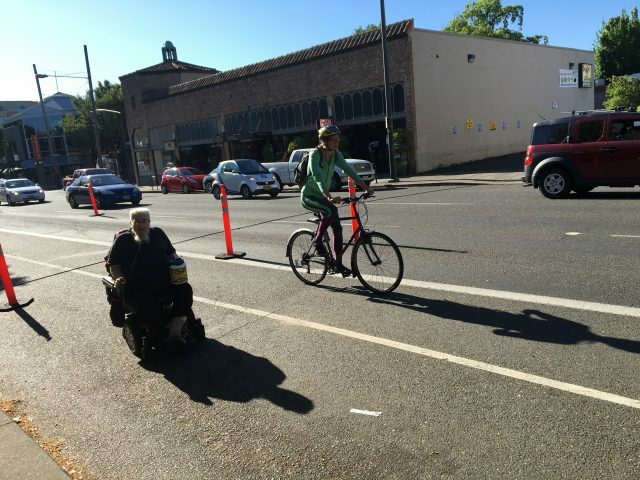 Hawthorne needs a 4-2 road diet with protected cycleways and wider sidewalks. It’s unacceptable for a corridor as popular as the Hawthorne District to have such tiny sidewalks. Will never happen. One-way streets provide the flexibility for bike lanes in the first place. The best thing that can be done to make couplets more bike/ped friendly is to install signals at each intersection to keep speeds low. I went to check out Better Broadway last night, and largest single thing that struck me was how much easier it now is to cross the street on foot. There’s nothing inherently wrong about one way streets (I don’t hear a lot of complaints about the pedestrian environment on NW 10th & 11th Aves in the Pearl), but there is something wrong with a one street with three lanes of traffic and up to 1,200 ft between marked crossings. When the city eventually gets round to upgrading Broadway I think new signals will make as much or more difference to the quality of the street as an upgraded bike lane will. someone misspelled “Sponsored” on the OnPoint sign and that someone would be me…. I walked Broadway yesterday (Monday) and was very impressed by the huge amount of volunteer work to narrow Broadway. 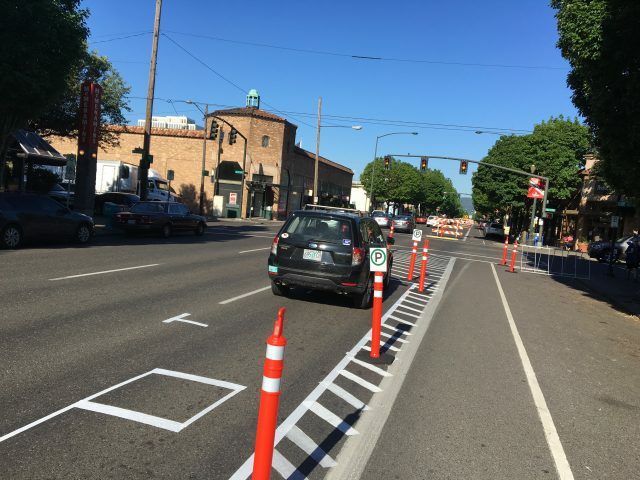 Overall, the street felt much calmer — more so than Weidler, even though Weidler is also only two lanes. I think cars were going slower on Broadway to try and sort out what was going on. The car parking is confusing (and people were doing goofy things in their cars to pull into the protected area and park against the curb). It’s good to know that one shorter stretch is getting the floating parking lane. I LOVED getting to easily walk across the street at the intersections rather than having to walk a block or two out of my way to find a traffic light. I walked across Broadway a couple of times just for the pleasure of it. Had to wait both times I crossed Weidler on NE 19th for traffic to clear (drivers tend not to stop, I think because they are driving so fast?). I’m also very excited by the floating bus stop — Multnomah makes me anxious on my bike when I’m riding my bike along with a bus. Looking forward to wandering the street some more over the next few days! I love driving Broadway. It’s like a 3 race track with little enforcement. We are still living with the 1950’s design. Rip it out, make it two way and watch business grow. Several businesses along Better Broadway set up outdoor seating or advertising in the area that was formally a parking lane. This really shows that not every merchant is worried about the parking spaces in front of their stores; some businesses want to have options to better utilize that space by the curb in front of their stores. More transportation options for people and more business options for stores sounds like a win-win to me. Too bad setup was on Mother’s Day? We should get green wands/barricades for these things. It’s hard to see the potential through all the orange. One way is never fine. It encourages speeding and reckless behavior. Portland needs to cut the cord from the 1950s and remove them all. Roads are for people, not racetracks. Broadway normally feels like a freeway, with multiple lanes of constant high speed traffic. Monday when I walked it with my six year old it felt a whole lot better, it felt like a main street. Thanks to all who made that happen, if only temporarily. If they do this again, it would be helpful to get PBOT parking enforcement to lay out the “no parking” signs along the study area for the day prior to installation (plus waive the fee that normally accompanies these “no parking” requests), and get any curbside parked cars out of there before the set-up teams show up. That could make it easier to get the “floating” parking areas installed. Yes, absolutely! The city could have easily done this and had parking enforcement come out and tow the illegally parked cars. But because they are taking a completely hands-off approach, we got a compromise. No amount of extra volunteers can make up for a lack of a tow-truck. The cars aren’t parked illegally. There are no “no parking” signs in the upper part of this project. There is also no instructions to park in the street. It is very confusing. I live on Broadway and residents received no prior notice that this project was happening, so as to make alternate parking arrangements on Sunday. I can understand why people are still parking on the street. The cones were in a completely different orientation this morning when I headed out for work, which lead to more confusion. People’s cars that were parked overnight last night were surrounded by cones this morning. For this project to work we need to work with the drivers, it’s not two separate sides. 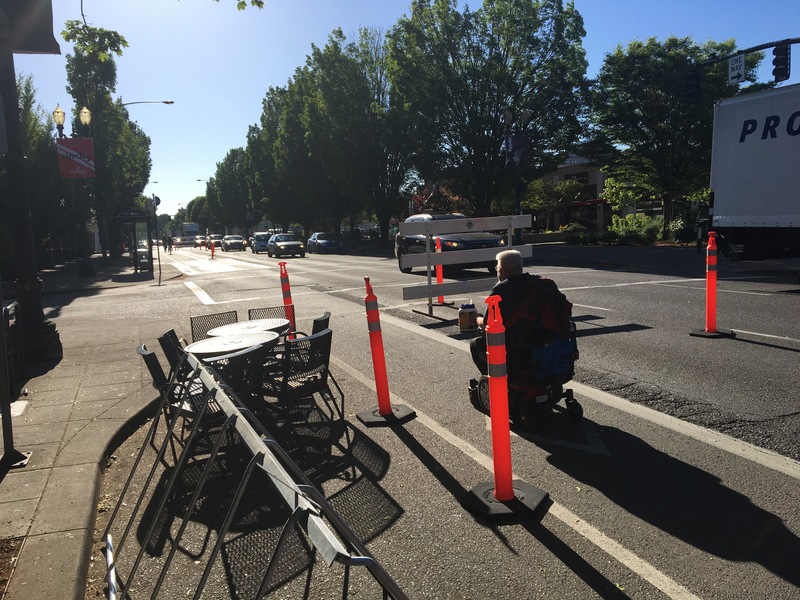 Drivers are just as much a part of the community we’re trying to create as are bikers and pedestrians. No, I totally understand. I’m not faulting the drivers at all. It’s a very confusing situation for everyone. My point is that the volunteers can only do so much. The city should have taken the responsibility to alert residents of the parking change, post no parking signs well in advance of the project so people had the opportunity to move their cars, and tow the remaining ones who didn’t heed the warning. This “hands off” approach to Better Block that PBOT is taking isn’t working. There needs to be at least some support. I took an Uber ride down it this morning. From a driver’s perspective (not a popular one on this board, but still valid), it was quite confusing and traffic was worse than what it normally. Don’t expect car users to be too happy about it. I took a drive in my own car down it this morning. From a slow driver’s perspective (I know, not a popular one out on the streets of Portland), I was excited to see people driving about 10mph slower than they normally do on the Broadway Freeway. 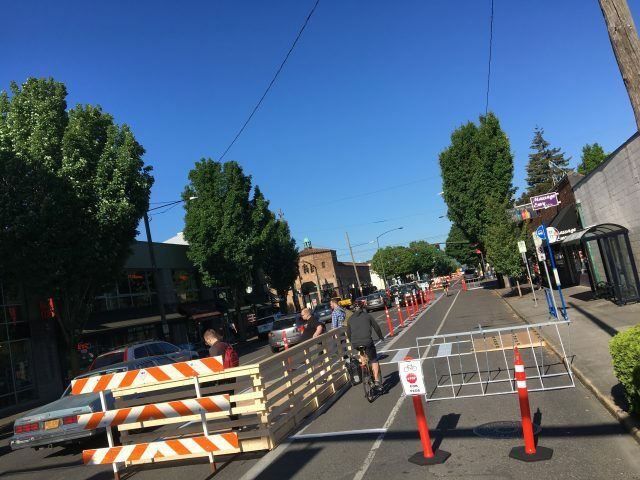 I was also pleased to see traffic moving smoothly, not backed up for blocks or trying to speed through yellows or around pedestrian “obstacles.” I do live on 8th and Schuyler, though, so I don’t expect this project to be popular with people speeding through my neighborhood to get downtown. I drive this route frequently for work and I don’t think it’s smoother at all and traffic is backed up far more. I used to be able to hit all the lights when one was green. Now I have to stop at practically all of them. Far less efficient from a car drivers perspective, especially in reference to fuel mileage. And the frustration of people, it’s definitely up… I drove Multnomah today and it cut my time to work in half. Yes I should just ride my bike, but it is not the form of transportation I need right now. That’s funny… In my experience, I only get all the green lights if I get stopped behind one red. In all other cases, it takes going about 35mph to make all the lights in the stretch of 24th-7th. Which is just going too damn fast for conditions, if you ask me. The ‘wave speed’ is not 35 or even very near it. If I ride from 24th to the Broadway Bridge I will often catch one red somewhere between 10th and 7th and perhaps another right before the bridge. My guess is the lights on the flat progress at about 20-22 mph. 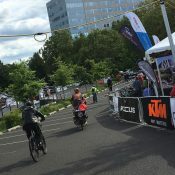 I second this, if anything the lights seemed timed perfectly for a fast cyclist, I would guess I catch almost all the greens if I ride about 20 mph, which is doable considering the slight downhill grade of Broadway towards the Willamette. Exactly… Being able to make all the greens vs. all but one. My point is that you can’t make ALL of them without traveling an excessive speed. Your point is that you can make ALMOST all of them traveling a reasonable speed? Our points are not mutually exclusive. And anyway, I said smoothly, not smoother. It’s definitely going smoother from the pedestrian perspective (the strongest interaction I have with the length of Broadway). And the sky certainly has not fallen for the autos, either. I see cars stopping short of most crosswalks just so they don’t clog the intersection. Which, last time I checked, was also really handy for cars trying to cross Broadway not at a light. Making streets more efficient for cars should not be a goal of a livable city. I-84 is a few blocks over if you want to drive unimpeded by red lights. I intentionally biked through here this morning after commenting about seeing it partially completed on Monday. I think that temporary projects are inherently confusing – it still looked like a construction zone to me. If cars were parked left of the bike lane, it would significantly improve the space because (1) there would be more pedestrian/bike/café space; (2) the parked cars would create a buffer (preventing cars from deciding to drive the bike lane anyway, which I saw this morning); (3) cars looking for/executing parking would not be driving in the bike lane. I also appreciated the bus stop island – especially once I got into a game of leapfrog with a bus at the other two bus stops in the test area. Cars were going slower (but not backed up when I was there) and I found myself riding more slowly and enjoying the surroundings. Leaving this area to continue commuting to downtown made for a big change. Car speeds picked up and I found myself riding faster and with more caution. I think these temporary improvements highlight the discomfort in other areas. Does every mile that I commute on need to have this kind of treatment? 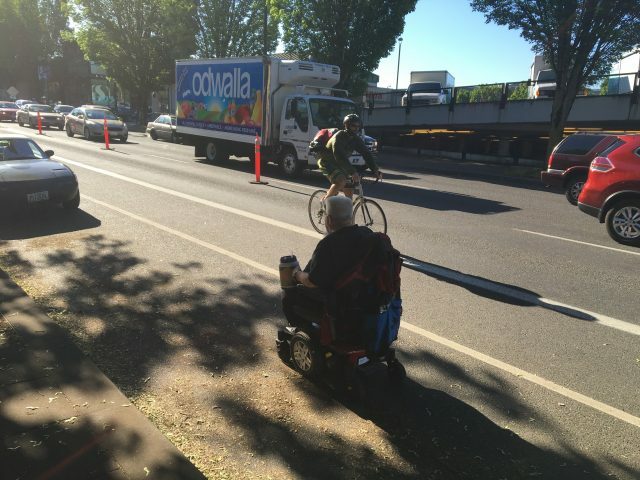 Probably not – there’s no real need for tables and chairs on the sidewalks while crossing I-5. 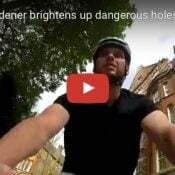 Some areas will always be less pleasant to ride – but all areas should be equally safe. I think the biggest difference a permanent infrastructure could make is in drawing me to shop/eat/enjoy Broadway as a cyclist and pedestrian. I usually avoid Broadway because I would rather ride on a residential street than on Broadway (because of traffic, exhaust, and general unpleasantness). Because I’m not on the street, I’m less likely to stop on Broadway for anything. I was surprised by some of the businesses I saw there today. Here’s the other issue, though – I would not stop at any of Broadway’s businesses on my way to work. 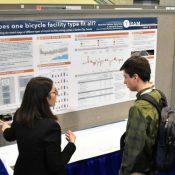 I may be more likely to stop on my way home or on a weekend because I see them in the morning, but most commuters I see ride the same pattern I do – to downtown in the morning and then east to my neighborhood at night. 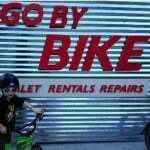 Maybe this is a business argument for a two-way bike lane? A lot of logistics to nail down to do this demonstration. I, too, biked through here today. My feeling is that it’s OK. I worried a bit about right hooks because I was a little farther to the right from autos. But I also see the potential from the demonstration. I would use Broadway regularly if they build a better version. I rode the whole distance of the project yesterday, and my impression is that the main thing the project is doing is confusing most people. To drivers, and some riders and pedestrians, the first thing they think when the see it is that some kind of construction is about to happen. That is certainly what I thought the first time I encountered it on my bicycle. Drivers have zero understanding of where they are supposed to park, and why would they, there is nothing there to tell them. The result is that there is only one block, between 15th and 16th where anyone is parking in the closed lane, rather than the usual curbside spot. And, I would bet the two cars parked in the closed lane belong to the business owners on that street who were featured in an earlier article. Also, very, very few businesses along the project are making any use at all of the curbside space that is supposedly available. While it is hard to fault the volunteers, who put in a whole lot of work, or the city, which knows the hackles it would raise if it spent money on the project, the widespread confusion tells me that no conclusions should be drawn from the project one way or another, because so few of the people passing through, or even living in or near, the project have any idea what it is. To make a valid assessment of this type of arrangement, a lot more signage and a lot more notice, at least to nearby residents and businesses, needs to take place before implementation of such an experiment. I would hope that would be the approach here, and we will see this done again, with a lot more publicity and for a longer trial period. But, I would not be surprised to find that the decisions have already been made. With the combination of my Tuesday evening experience and what I just read, it all makes sense. I won’t Captain Hindsight it all, but those 17 blocks were clearly a bigger bite than Better Block could chew. The planning didn’t consider how much it would feel like a construction zone, and the execution was mostly hindered by—wait for it—cars. Just shy of the halfway point, you can tell where this is headed, and we can only hope that the results will be interpreted as inconclusive. Failure is part of the experimentation process, but you don’t want it sullied by preventable mistakes. This is one match in the book, not just of funding but public appetite, and we mustn’t burn through it too quickly. Still, I hope this experiment is iterated next year and that volunteer outreach gets to me in time. Feels like I just read the word ‘failure’? It’s not hindsight precisely because it’s not even over! I was just over there and volunteers were making adjustments. We don’t actually know what events or retail business promotions may happen in the next few days. One clearly observable effect noted above, that I can confirm, is that it’s a more peaceable experience being on NE Broadway right now, for people not in cars. If you’d sort of like this kind of thing to succeed, hump yourself over there and spend $20. Everything else is just more comments. Oh yeah–also ride your bike over there. Drive by? I drove by the Grand Canyon once so I know pretty much everything about that! If you just troll through on your bike it’s a good visual but this is a business district people. Wear your helmet or your bike lapel pin or, gasp, some lycra, and spend a few bucks. The overuse of the car is killing us and killing portland. I get that most folks prefer to drive. Why not? It’s literally bred into us. Broadway is a perfect of good ideas that turn bad. Portland knows that…and is now supporting a change. There will always be those who can’t or won’t appreciate a change and the huge benefit it has in the person not caged up in their car. It’s the folks who aren’t born yet or who don’t drive yet that will thank us for the heavy lifting. Broadway, in its current form, has to go.